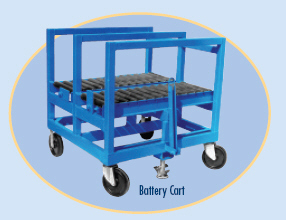 Battery Stands & Carts - Roll-A-Way Conveyors Inc. Minimize the manual handling of electric lift truck batteries. Use a Cart and Stand in tandem, or independently. Rugged steel construction. Conveyor rollers are 2” dia., 12 gauge steel, 4” on center, with 7/16” hex axles. Consult factory for specials. Powder coated blue.